The Social Work Club concluded their annual Take Back the Night Week with a March for Victims of Domestic Violence. Students, faculty, and the community gathered with signs, banners and tee shirts designed to raise awareness for the cause. The students in the Social Work Club collaborated for two months to organize the TBTN events, scheduling the speakers and marketing on social media and throughout the community. “We all took different roles and contribueed in some way,” said Social Work student Ben Mostoller. Social Work students often utilize courses from the Women’s Studies program to learn about family structure and marriage, both of which play a significant role in the social work profession. “It’s very important for us to learn those things, because we all have different fields that we want to go into,” said student Bri Guy. “Some of us want to work with adoption agencies, victim services, or families. The classes we take tie everything together. In addition to the March for Victims, TBTN Week sponsored guest speakers, free self-defense classes, a “Walk in Her Shoes” March for high-heeled-adorning men, and educational programs. 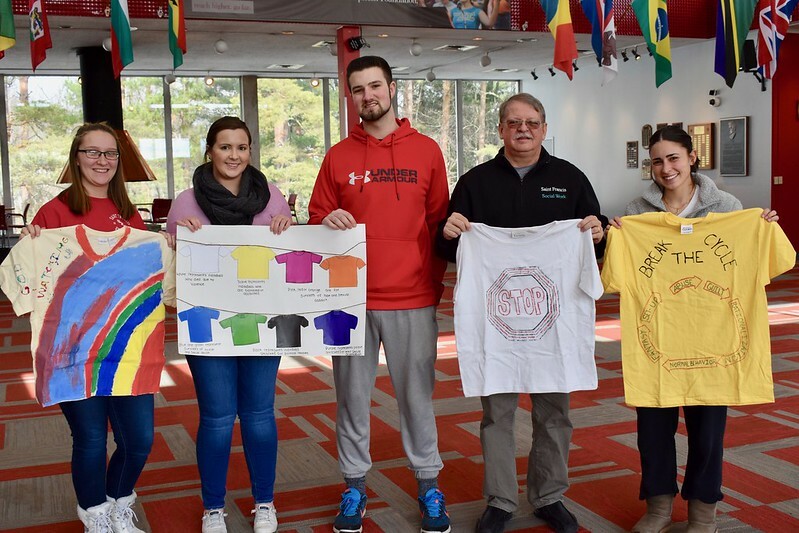 One such program was the Clothesline Project, which allowed students to make tee shirts with messages of hope and personal connections to domestic violence. The colorful shirts offered a powerful visual representation of the silence surrounding the issue, and the often painful healing process that victims are subject to. In addition to Take Back the Night Week, the Social Work program provides its students with many opportunities to gain work experience in their future field, such as agency internships and their annual charity golf tournament to raise money for Cure for Spinal Muscular Atrophy.